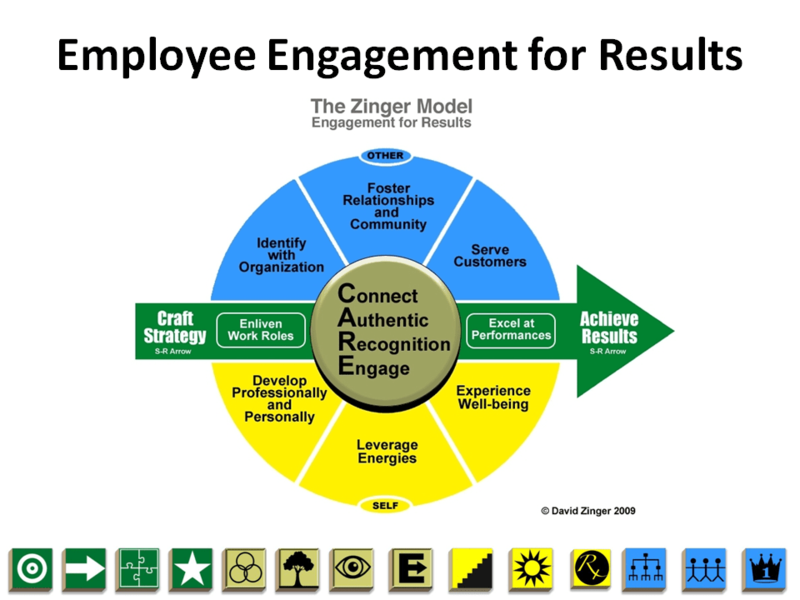 The Zinger Employee Engagement Model is composed of 14 symbols. On the ‘green line’ of engagement between achieving results and crafting strategy is excelling at performance. Excel at performance. Engagement for results can contribute to effective performance management. Performance demonstrates our engagement while engagement can help us excel at performance. Good employee engagement should foster star performers. We want to help each employee become a star performer to benefit customers, the organization, and themselves. Bi-directional performance. We need to help everyone in the organization perform at their best while also engaging them in their own performance management. In this way, employee engagement is bi-directional in that engaging in your own performance management may increase your engagement while excelling at performance will also increase employee engagement and results. Craig Althof recently had a guest post from Sean Conrad, How to Better Engage Employees in the Performance Management Process. In many, if not most companies, performance management is something that managers “do” and employees “receive”. That tends to lead to employees being disengaged from the process, and even cynical about it. Employee self-appraisals help fill that knowledge gap and avoid surprises. But more importantly, they give the employee an active role in the process. giving employees access to the organization’s high level goals, and the department’s goals, then asking them to identify how they, in their role, will contribute to these is a great way to give them context for their work and to get them committed to their goals. It’s hard to be engaged in something that only happens once a year…Employee performance is really something that should be managed on an ongoing basis. When done well, employee performance appraisals can be an invaluable tool for driving employee engagement. How well are you engaging employees in performance and ensuring performance contributes to engagement and results? David Zinger, M.Ed., works with organizations and individuals to foster engagement. He is a writer, educator, speaker, and consultant who founded the 3000 member Employee Engagement Network. David’s book, Zengage: How to Get More Into Your Work to Get More Out of Your Work will be released this September. David’s website offers 1100 free posts/articles on the engagement. David is committed to fostering a movement to increase employee engagement 20% by 2020. Bi-directional performance. Interesting concept. Thanks for sharing it.